If you have uploaded multiple datasets to Koordinates you can arrange them into sets. A set is a collection of data layers and tables that can be viewed and downloaded at one time. 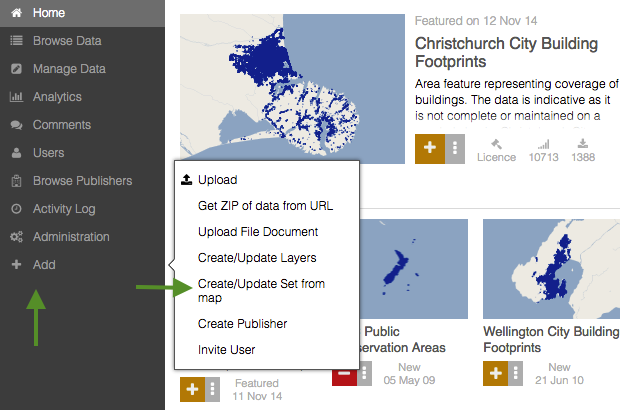 Publishers can use sets to enable users to access datasets that are commonly grouped together. The benefit of a set is that it allows users to add and download these datasets in one go, instead of having to add them individually. This guide outlines how to create, edit and manage permissions for sets on your Koordinates site. 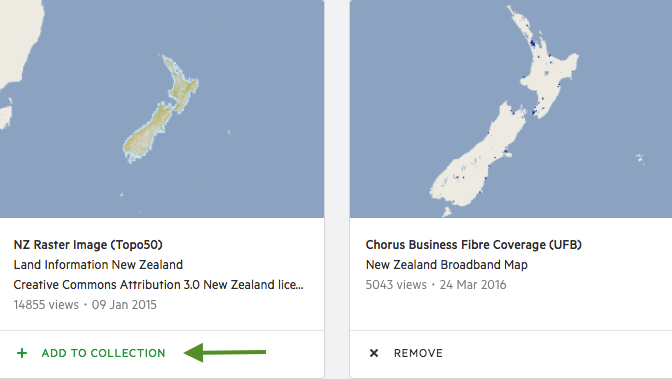 Before creating your set, you will need to find and add your chosen data to the map. You can do this by clicking Add to Collection for each data layer. Once you have added your chosen data to the map, click the Add option in the main menu on the left hand side of your screen. You’ll be given a range of options, including Create/Update Set from Map. You’ll then be giving the option of naming your set, as well as the option of replacing an existing set. After your set is created, the set will appear in a similar form to individual data layers. Many of the features Koordinates provides to data layers -- such as analytics on usage - are also provided to sets. After creating your set, you can add descriptive information by navigating to the Edit page, which you can find by clicking on the options tab next to the set’s large ‘+’ (or add) sign. After selecting Edit, a pop-up screen will give you the option of adding a description, category and tags. You can also add metadata for your set. The method for this is the same as for an individual data layer. In the Edit screen, you will also be provided with the option of managing permissions for your set. For the most part, the permissions process is identical to that of permissions for individual datasets. You learn more about permissions in our permissions guide. Note, however, that your set permissions will only apply to the set itself, and not to the individual data layers or tables contained within that set. If, for example, you include a publicly available dataset within your private set, that dataset will remain publicly available. To put this another way, the permission setting for your sets will not override the permissions settings for each of the set’s data layers.